In this segment, we bring you yet another great example of death by stupidity. The author of the worldwide welding web page makes it known that in order to protect oneself from harm, a welder has to always give thought to what he is doing. He has this theory that the reason why welders become welders in the first place, is because thinking isn’t among their strengths and according to him, therein lies the problem. He firmly believes that the reason why welders in the United States generally don’t make it to retirement age can be put down to the calibre of individual the profession attracts. The following is one just of several examples he uses to support his case. 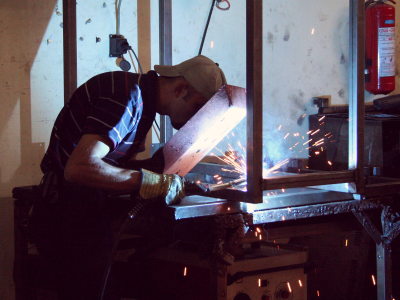 “One welder was assigned the arduous task of cutting out a large section of a pre-fab unit for replacement. Cutting operations are of course, easiest cutting below yourself, and the welder thought he was finished, but the hole he had cut didn’t fall out of the bottom of the unit as planned.